, phylum of invertebrate animals comprising the sea anemones, corals, jellyfish, and hydroids. 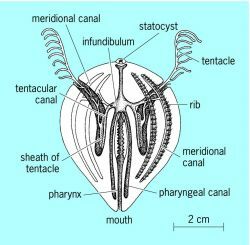 Cnidarians are radially symmetrical (see symmetry, biological). ..... Click the link for more information. ) but lack the cnidarian whorl of tentacles around the mouth. They lack the specialized stinging cells (nematocysts) found in coelenterates, but one species (Haeckelia rubra) incorporates those of its jellyfish prey for its own defense. Ctenophores, which are all carnivorous, have specialized adhesive cells called colloblasts, used to capture planktonic animals on which the ctenophores feed. Approximately 50 species are known, but many become locally abundant and are ecologically significant. They vary from less than 1-4 in. (0.6 cm) to over 1 ft (30.5 cm) long. Most are transparent, but pale pinks, reds, violets, and oranges are also known in some species. Most ctenophores are also bioluminescent, the production of light originating in the walls of the eight canals. Most ctenostomes are hermaphrodites, developing through a cydippid larval stage to adults. They can also regenerate lost parts. Members of this class typically have two feathery tentacles that can be retracted into specialized sheaths. In some, there are smaller, secondary tentacles, and the primary tentacles are reduced. This class includes the small, oval sea gooseberries (genus Pleurobrachia), common on both Atlantic and Pacific coasts. The more flattened Mnemiopsis, about 4 in. long (10 cm), is common on the upper Atlantic coast. Known as a sea walnut, it has a large mouth and feeds mainly on larval mollusks and copepods. This species is brilliantly luminescent. The similar, but larger, genus Leucothea is abundant on the Pacific coast. Venus's girdle (genus Cestum) is a flattened, ribbonlike form reaching over 1 yd (91 cm) in length, and found in tropical waters. This class includes species that have no tentacles. Typical is the large-mouthed genus Beröe, which feeds on jellyfish and other ctenophores. A phylum of exclusively marine organisms, formerly included in the jellyfish and polyps as coelenterates. These animals, the so-called comb jellies, possess a biradial symmetry of organization and have eight rows of comblike plates as the main locomotory structures. Most are pelagic, but a few genera are creeping. Many are transparent and colorless; others are faintly to brightly colored. Almost all are luminescent. Many of these organisms are hermaphroditic. Development is biradially symmetrical, with a cydippid larval stage. Five orders constitute this phylum: Cydippida; Lobata; Cestida; Platyctenida; Beroida. The body is gelatinous and extremely fragile; its form may be globular, pyriform, or bell- or helmet-shaped. Some species resemble a ribbon. Their size ranges from to 20 in. (3 mm to 50 cm). The axis of symmetry is determined by the mouth and the organ of equilibrium, or statocyst (see illustration). The mouth leads into the flattened, elongated pharynx. The sagittal plane is thus referred to as the stomodeal plane. The other plane of symmetry is perpendicular to the sagittal plane and is marked (Beroida excepted) by tentacles. Eight meridional comb-plate rows or ribs stretch from the ab­oral pole on the surface of the body. The comb plates, which are used as oars during locomotion, are the most characteristic structure of the ctenophores, possessed by all members of the phylum. Each plate consists of a great number of very long related cilia. Fertilization usually occurs in seawater. Pelagic ctenophores are self-fertile, but cross-fertilization might also take place inside a swarm of ctenophores. Ctenophores have high powers of regeneration. Asexual reproduction (in a few platyctenid genera) is by regeneration of an entire organism from a small piece of the adult body. The ctenophores feed on zooplankton. They are themselves important plankton organisms. They are quite common and have a worldwide distribution in all seas, where they can appear in enormous swarms. Some genera stand great changes in the seawater salinity. Because of their voracity as predators of zooplankton, they play an important role in plankton equilibrium and in fisheries. The body of Ctenophora is gelatinous, transparent, and biradially symmetrical. The Ctenophora differ from other Coelenterata chiefly in their organs of movement, which consist of eight rows of comb plates arranged meridionally on the body surface (that is, specially modified bundles of in-teragglutinated cilia). In addition they lack stinging cells, and the function of grabbing the prey is usually performed by special adhesive cells of the external epithelium. The body is sacciform, with the mouth at one end and an organ of equilibrium at the other. The animal moves mouth-end first. Some types swallow food directly, but most have a pair of long tentacles on the sides of the body that are covered with adhesive cells and are used to capture the food. The mouth leads directly to the throat and stomach, from which a system of blind evaginations leads to the body’s periphery; these evaginations are called the radial and meridional canals. Between the body wall and the intestinal wall there is a layer of transparent gelatinous substance called the meso-glea. Ctenophora are hermaphrodites. More than 100 species of Ctenophora are known. They are found in all oceans and live at various depths. They are predators, feeding on small planktonic animals, sometimes including the roe and young of fish. Certain species, such as those of the genus Beroe, feed exclusively on other species of Ctenophora. Some lead a creeping mode of life; these include the coeloplanulae described by A. O. Kovalevskii and Ctenoplana (discovered later). Many Ctenophora are phosphorescent. Rukovodstvo po zoologii, vol. 1. Edited by L. A. Zenkevich. Moscow-Leningrad, 1937. Zhizn’ zhivotnykh, vol. 1. Moscow, 1968. The comb jellies, a phylum of marine organisms having eight rows of comblike plates as the main locomotory structure. That ctenophores appear to have diverged earlier than placozoans and, possibly, also poriferans, came as a surprise because ctenophores appear to be much more complex (Ryan et al. Uber das Apikalorgan (Statocyste) der Ctenophore Pleumbrachia pileus. A newly acclimated species in the Black Sea: ctenophore Mnemiopsis leidyei (Ctenophora: Lobata). If a ctenophore is tilted or displaced from either position of vertical balance, it rights itself by asymmetric frequencies of comb plate beating on the uppermost and lowermost comb rows (Horridge, 1974). We routinely collect ctenophores with sediment in their stomodea and with benthic materials (such as benthic diatoms) in their food grooves. Predators of oyster larvae include scyphozoans, ctenophores (Nelson, 1925; Purcell et al. The mean a and b axis radii as viewed aborally for this ctenophore size class (n = 8) are 43 [micro]m and 40 [micro]m, respectively. ROVs support research ranging from studies of undersea landslides caused by the 1989 Loma Prieta earthquake to the behavior of delicate gelatinous animals like ctenophores and the distribution of cold-seep communities in the bay. The ctenophore Mnemiopsis leidyi (Agassiz, 1865) in coastal waters of the Netherlands: an unrecognized invasion? Stealth predation and the predatory success of the invasive ctenophore Mnemiopsis leidyi. This behavior is part of a shadow response that functions to avoid predators such as ctenophores and cnidarian medusae that occur near the surface and cast a downward shadow (e.
So the ctenophore gut is functionally like that of the cnidarians.